Enchantingly rich, intensely floral, unique. Dried black cherry, tea rose, Cognac, chocolate fudge, gently scorched almond wood in aroma and cup. Deeply sweet-savory in structure with crisp, apple-toned acidity; plump, syrupy mouthfeel. Exceptionally long finish that carries over all the aroma and flavor notes from the cup, plus an umami intrigue akin to candied bacon. This exceptional coffee was selected as the No. 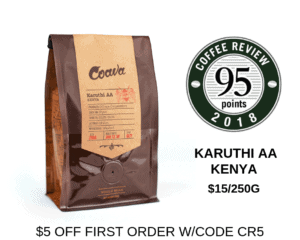 1 coffee on Coffee Review’s list of the Top 30 Coffees of 2018. Mocca (also spelled Moka and Mokka) is a famous variety of Arabica that reached Kaanapali, Hawaii from Brazil. Current thinking in the technical coffee community is that it originated in the Reunion Islands as a mutant of the great Bourbon variety. It may well have originated in Yemen, however, where varieties displaying the identical, very unusual bean size and shape are known as Ismaili, as well as by other local names. This Mocca was processed by the dry or “natural” method, meaning the beans were dried inside the fruit rather than after the fruit has been removed, as is the case with wet-processed or “washed” coffees. This rare coffee with its tiny beans and striking cup is available only on the Hula Daddy website through their allocation list. Hula Daddy is a boutique coffee producer with farms at the 1,400 and 2,500 foot levels of the Mount Hualalai volcano near the northern end of the Kona growing district, five minutes above the town of Kailua-Kona. This coffee was produced at the higher elevation Hula Daddy farm. Visit www.huladaddy.com or call 888-553-2339 for more information. The Bottom Line: A marvel of a coffee, inviting and esoteric, chimerical and grounded, all at once.